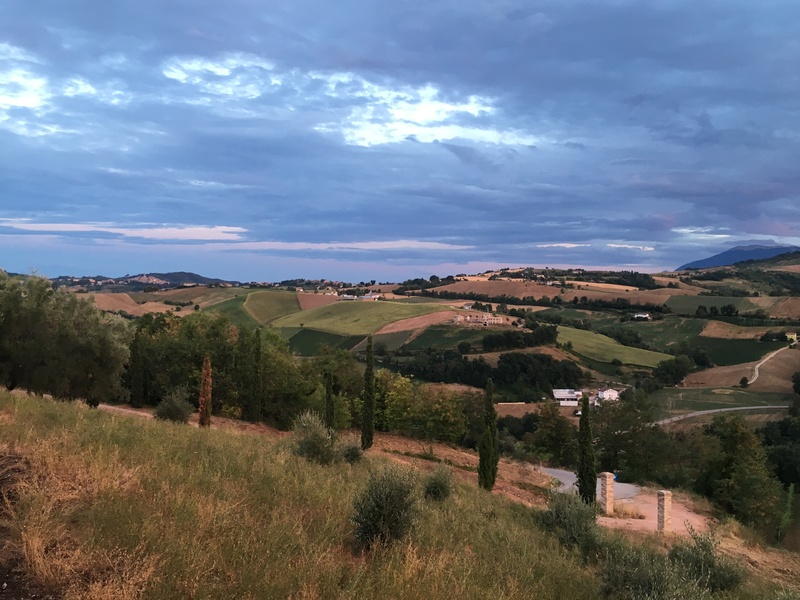 This summer, we enjoyed a villa holiday in Le Marche, a region which stubbornly remains off the radar to most non-Italian holidaymakers in spite of it offering everything a family could wish for from a summer holiday (in my opinion anyway). When I worked in the travel industry I was forever singing the region’s praises to PR agencies and journalists but it appears this fell on deaf ears. 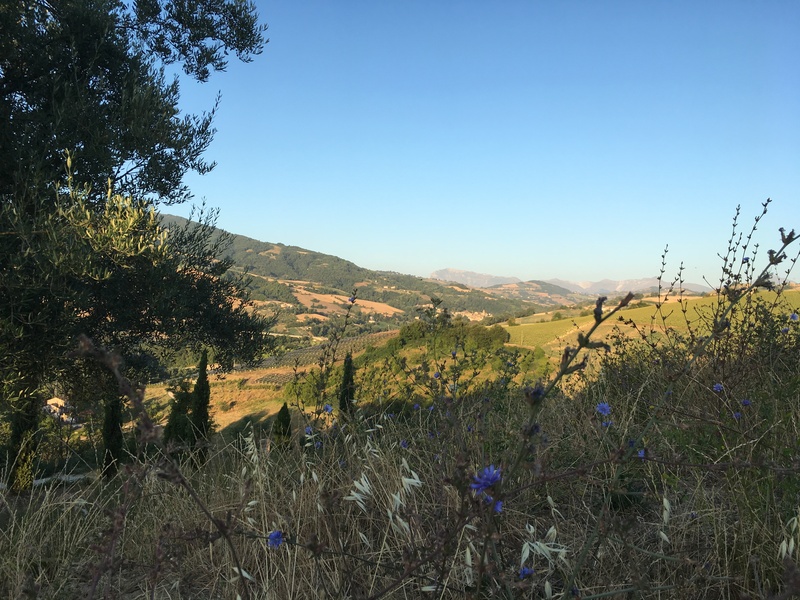 Well, their loss was our gain in late July as we explored tranquil villages, ate like kings and soaked up the sun on the fabulous Adriatic coast. 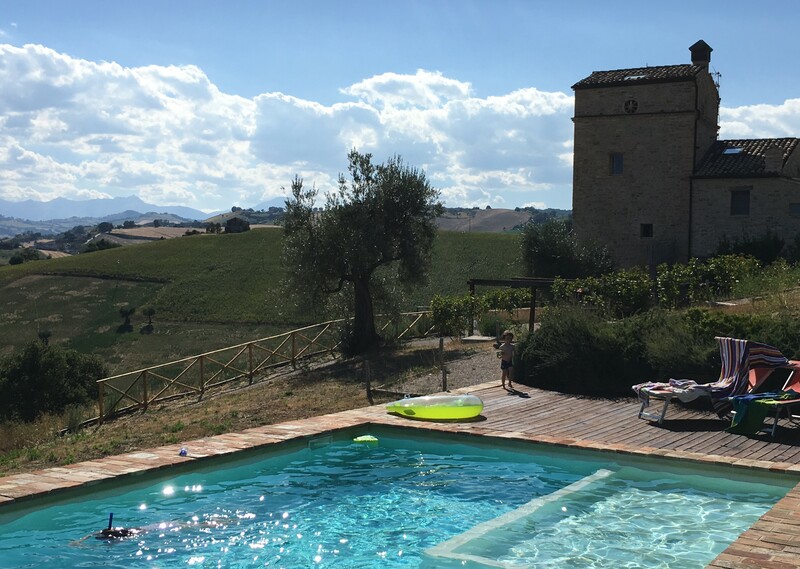 We stayed at Casa Ulissi for our villa holiday in Le Marche, a converted watchtower perched on the side of a hill just below the tiny village of Montedinove which in turn is located midway between the Sibillini Mountains and the Adriatic Sea. 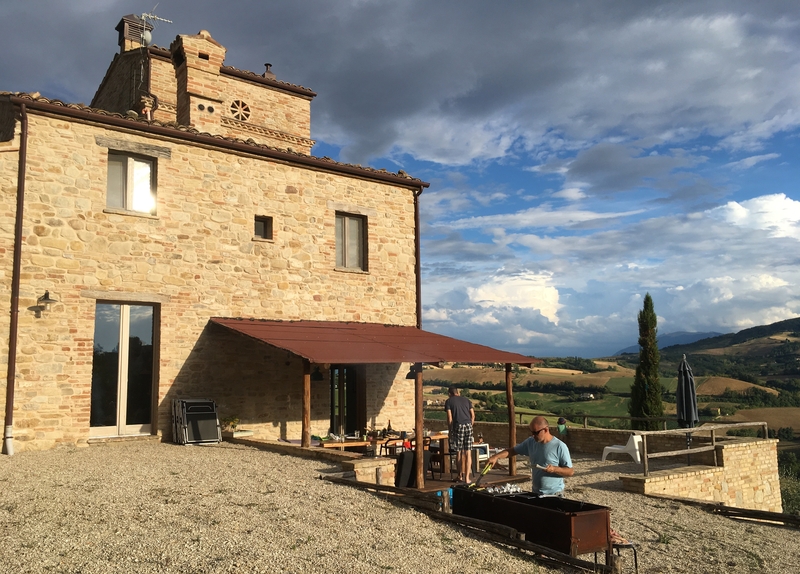 Casa Ulissi is perfect for large families or groups of friends. Of the five bedrooms, there are three doubles, one twin and a bedroom with bunk beds. One of the double bedrooms occupies two upper floors with its own living room and bathroom, ideal for those who like to keep a bit of space between themselves and their loved ones. WiFi is available too in case that’s a deal breaker among a certain age group. The owner has restored the building with care and style. There is a great balance between original features such as beamed ceilings and tiny windows (perfect for keeping the heat out) and modern touches such as the well equipped kitchen and the contemporary bathrooms. Much of the furniture is antique or reclaimed but, like most rental properties (and homes in general), there are unmistakable Ikea “accents” here and there. I didn’t take any internal images of the house for this post as I’m still in the early stages of my travel blogging career and rate taking an immediate dip in the pool a lot higher than meticulously photographing my living space before it is destroyed by small children. However, the agent’s website has a pretty comprehensive selection of images and I can attest to their accuracy in terms of style and comfort. 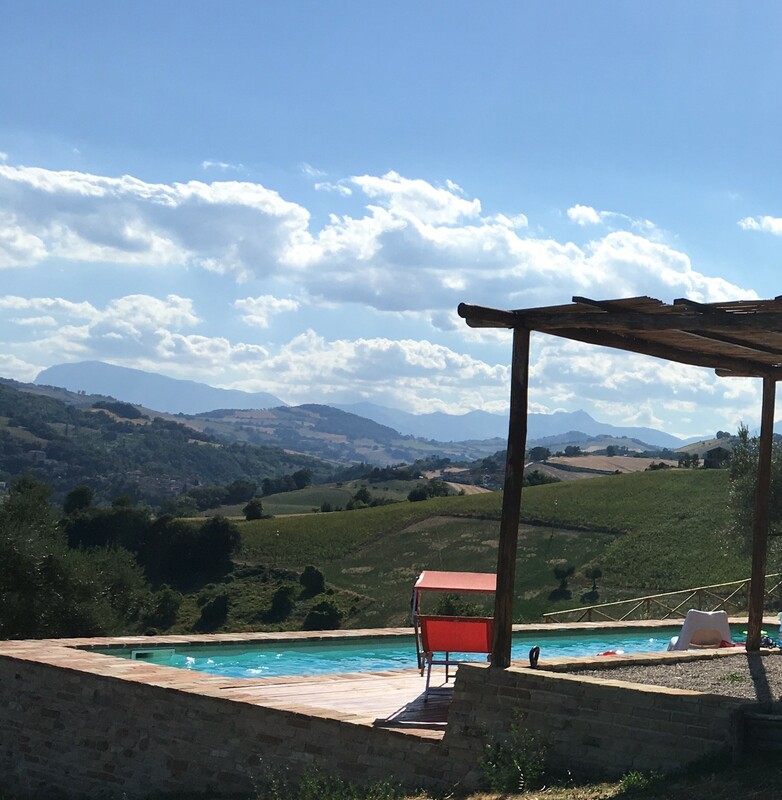 A villa holiday in Le Marche: breakfast, lunch and dinner all happened here. Outside is where we spent most of our time (in fact, we didn’t use the vast and beautiful indoor dining table once). A gravelled terrace surrounds the property on three sides and it’s here we enjoyed many great meals. 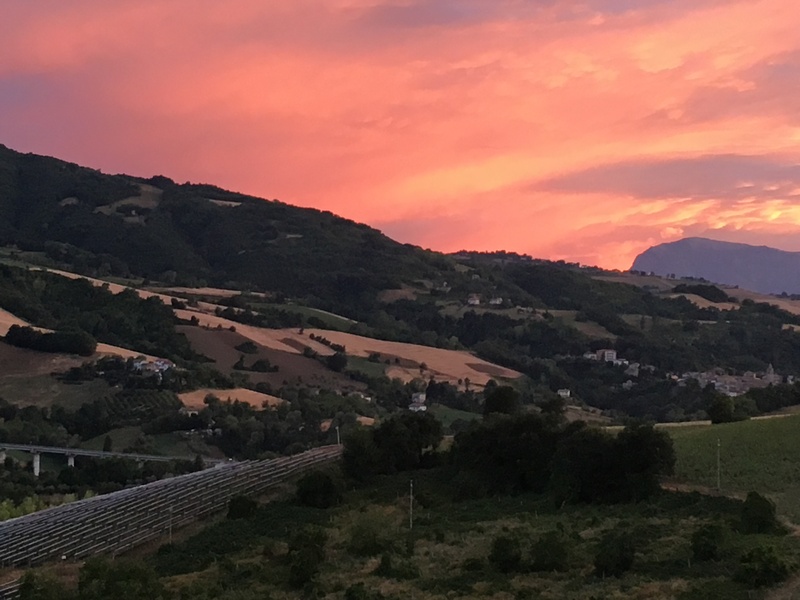 I won’t try to list the superlatives which sum up the sunsets and (thanks to my three year old…) sunrises we saw from Casa Ulissi, hopefully the photographs do them justice. Unfortunately, wasps were quite a feature at mealtimes. However, they were not aggressive, just appreciative of the spread we’d laid on so no one was stung. Building elaborate wasp traps became something of a pastime for the children. They (the wasps, not the children) all disappeared around sunset. Evenings were delightful at Casa Ulissi. At quite an elevation, there was always a gentle breeze, belying the fierce daytime temperatures at sea level. To one side of Casa Ulissi is a good size swimming pool. My children have yet to gain that terrifying confidence of leaping into an unfamiliar body of water so the enclosed shallow area was perfect for them while the older children enjoyed practicing their diving in the deeper section. 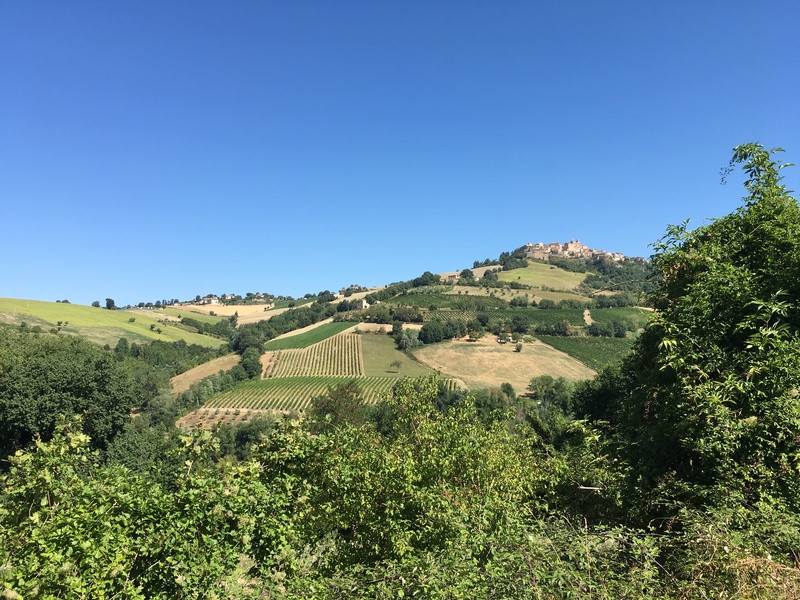 It was a short, steep drive from the villa to Montedinove, a proud community where on one occasion locals emerged from the village museum and encouraged us to come in and learn about the history their tiny settlement. The Adriatic Sea is just visible on the horizon from Montedinove. For such a small and remote place, Montedinove has quite a trendy bar offering very good aperitivi. 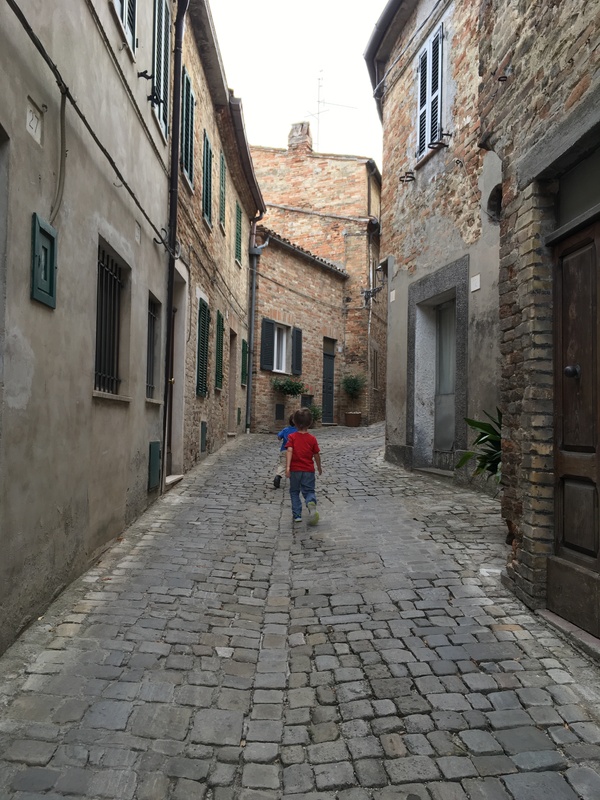 The village was quiet enough for our little gang of children to wander off and explore while we sampled some of the wines and antipasti. 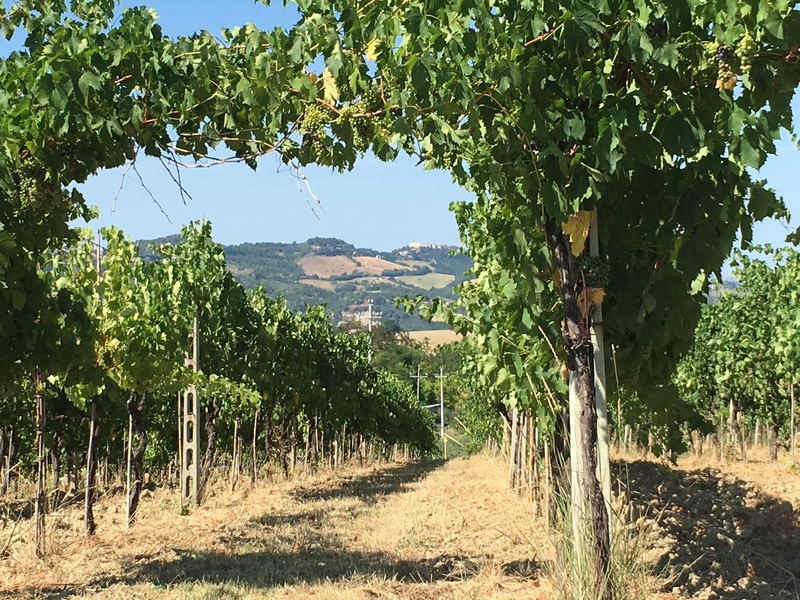 Just two minutes’ drive (or 10 minutes’ walk if you’re feeling confident about the return hike in the heat) down the hill from Casa Ulissi is Le Vigne di Clementina Fabi, a particularly enjoyable vineyard in which to while away an afternoon. Not only did we sample some excellent wines but we were also given an amazing array of local hams, cheeses, jams and breads to indulge in. Loretta, the owner, believes food is an essential part of wine tasting and we all agreed. 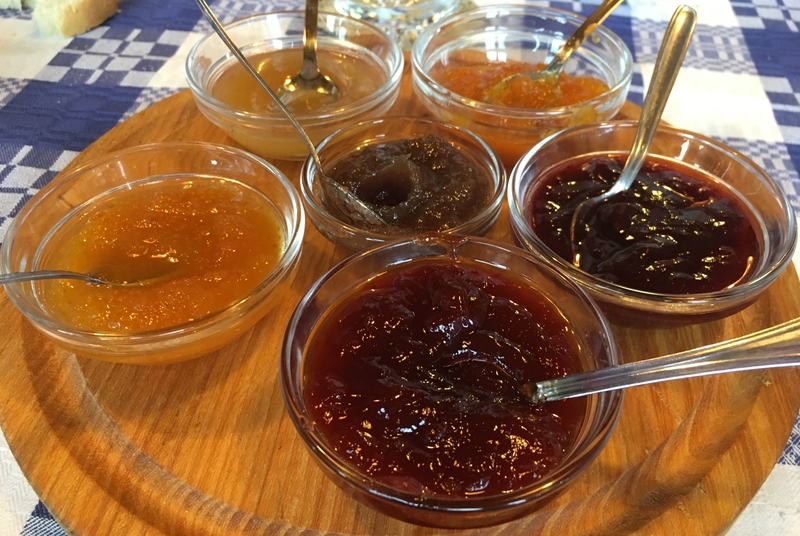 On Loretta’s recommendation, we spent a large part of our final day having lunch at Ristorante la Madonnina, hidden away somewhere near the village of Rotella on a neighbouring hilltop. There was no menu, just a seemingly unending number of dishes; fried quails’ eggs served with crispy pancetta and wild boar ragu were some of my favourite delicacies from the meal which was washed down with jugs of local wine. 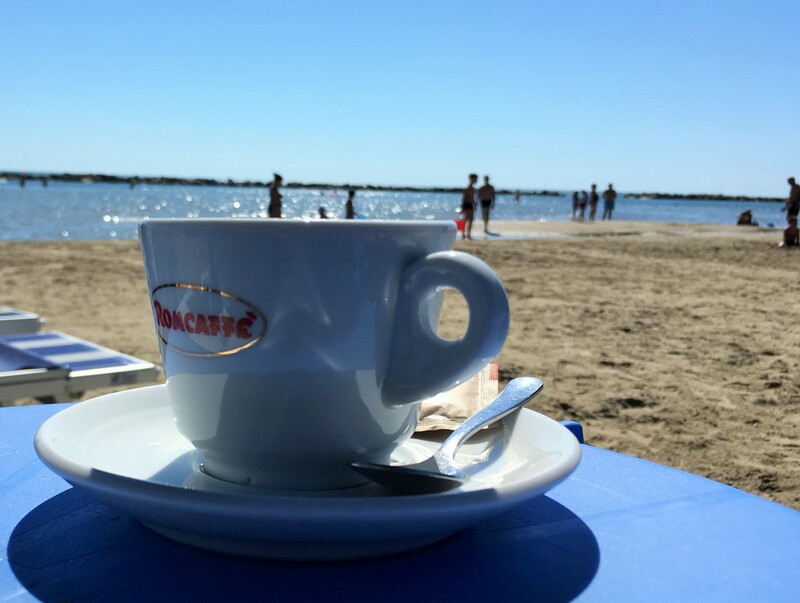 I do like to be beside the seaside in Grottammare. When we weren’t eating, which was rare, we spent much of our time at Grottammare, the nearest beach resort to our villa. It was a pleasant 30 minute drive past plum orchards, vineyards and sunflower fields with enough farm machines in action to keep our two sons entertained. 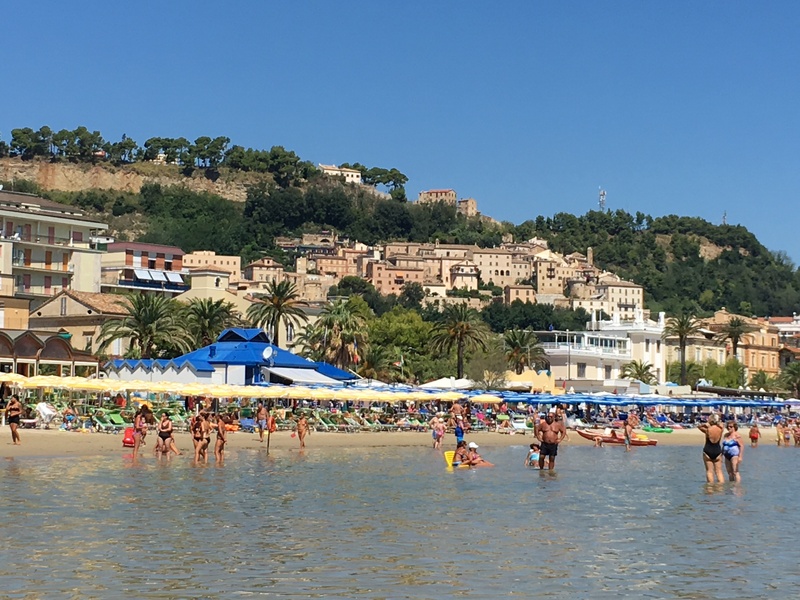 Backed by a promenade and lined with pizzerias, ice cream parlours and bars, Grottammare is everything I could want from a beach resort at this stage of my family’s life. Akin to bathwater in both depth and temperature, the sea here is delightful for reluctant toddlers; parents meanwhile can relax on sun loungers while sipping a morning cappuccino. 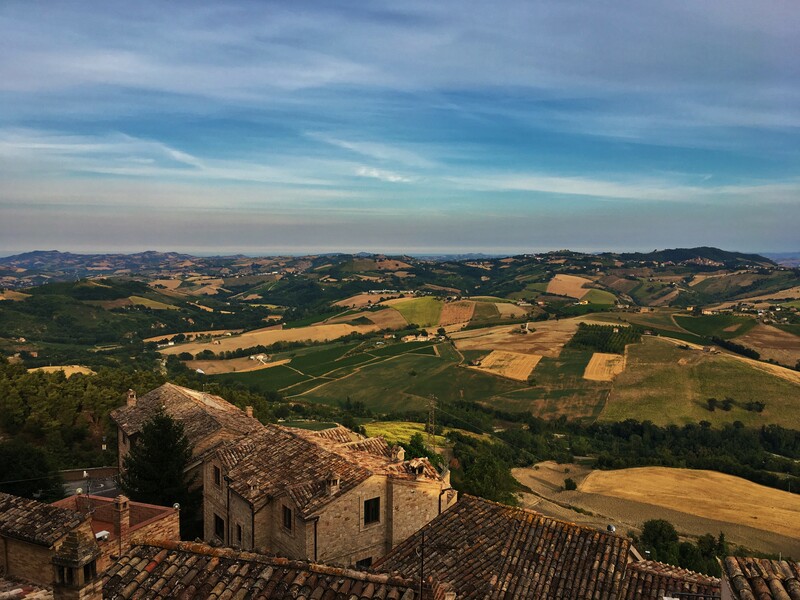 Never visited Le Marche? Find out why it’s a great destination for children. We booked Casa Ulissi through Felix Villas, a small UK-based villa company with a great selection of properties on their site. I would definitely use them again. There are two airports within 90 minutes’ drive of the villa, Ancona and Pescara, but if you’re travelling from the UK you are limited to Ryanair and Stansted with both of them. After checking lots of different routes, we opted to fly into Rome Ciampino as it was significantly cheaper. It’s a 3 hour drive from Rome to the villa but we saved around £100pp on the flights. The drive across the country is pretty straight forward if you’re not in a hurry. We took two different routes through the mountainous Gran Sasso National Park, both stunning and peaceful with good roads. 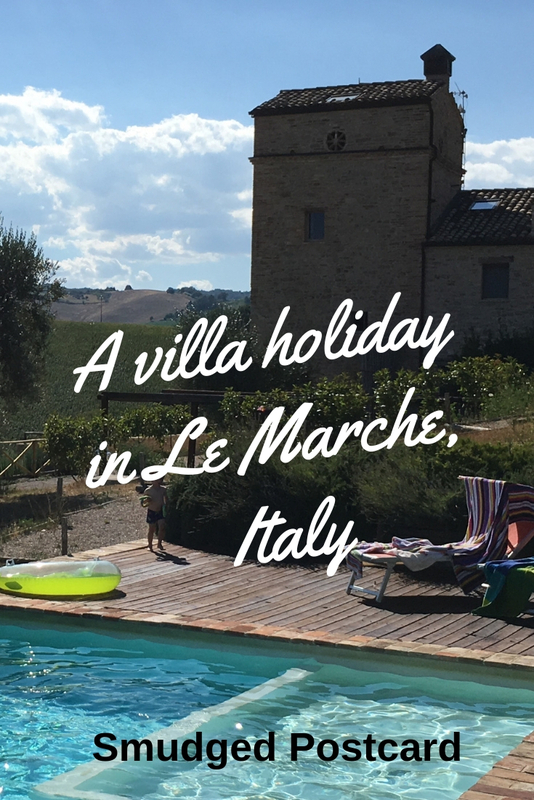 Have you had a villa holiday in Le Marche? Let me know in the comments below. Yes, I would love to be there now! Wow, 5 weeks in Puglia, lucky you! I’ll have to have a read of what you’re up to! Yes, I’d happily do the drive again! This is so so beautiful! 🙂 The views are spectacular, not to mention that sunset – wow! Lovely colours. Now this looks like a proper holiday! I bet it was so fun to rent a villa with friends (or family) – this seems like a really typical European way of vacationing! 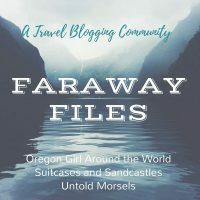 I normally just travel with only my husband but there’s something to be said of group trips! I’m hoping to do something like this next summer in France but on a smaller scale – like perhaps a cottage rather than a villa. 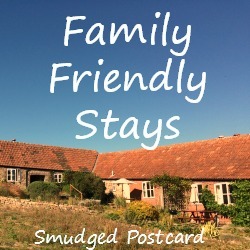 Well, there’s a huge variety of self catering places in France, gites are a good value option. This looks absolutely lovely and then there is the beach and vineyard not too far away. I just don’t understand why more people don’t know about it. Well it is definitely their loss. I hope to make it there before everyone else catches on. Thanks for sharing on #TheWeeklyPostcard. Happy to read this again for #TheWeeklyPostcard! Definitely a new fav! Thanks for linking up! I am CONVINCED! What a beautiful and relaxing way to enjoy the peacefulness of the Italian countryside! This looks like such a hidden gem of a place – and that sunset is to die for! I’m a sucker for things like that. Thanks for sharing! Looks so beautiful. I taught English in Modena, Italy in my twenties and travelled a lot while I was there. Not been back yet with the children but REALLY want to. Just wondering whether it’s not too stressful to get us all there by train and bicycle!!! Have you looked at the website Seat 61? He’ll convince you it’s doable! Ah yes, sun on the face, I’d better read my own post again. I’ve totally forgotten what that feels like. Haven’t even left the house for 3 days due to poorly child. Roll on summer 2019!